The recent examination of the cold war era through the depiction of early 1960s Berlin in the 2015 film Bridge of Spies and the drama series Deutschland 83, reminded me of a visit I made to the city in 1986 and again in 2008. On both occasions I took a photograph from the same vantage point – the visitor’s platform of Berlin’s TV Tower near Alexanderplatz. I recently placed them side-by-side. This is the story of how I came to take them. Today it’s hard to imagine the absurdity of East and West Berlin. West Berlin was a small western enclave enclosed by the East German state, some 100 miles east of the West German border. Somehow after the Second World War the western allies, through the Berlin Airlift initiated because of a Soviet blockade, managed to preserve West Berlin’s existence as a symbol of western freedom in the heart of the Communist Bloc. In 1961 the German Democratic Republic (GDR) government, fearing a brain drain and loss of ideological credibility, built a concrete barrier encircling West Berlin dividing the city, scenes imagined in the film Bridge of Spies. In 1989 the wall came down, the communist bloc disintegrated and a process of East and West German reunification began. In 1986 travelling by train to Berlin through East Germany was a unique experience. Station platforms presented soldiers rigidly standing to attention with rifles barrels pointing skyward as the train travelled through. This alerted us to the strictly controlled and deeply distrustful state we had entered. It was as if the GDR leaders were subconsciously messaging the on-board western passengers, “Don’t mess with us!” As the train approached Berlin it stopped at the eastern side of the wall. Alsatian dogs were deployed to search under the train for any concealed East German citizen desperate to escape to the west. They didn’t find any. Eventually the train began to move and we rolled through the border crossing into the relative normality of ‘decadent’ West Berlin. There was perhaps an understandable air of insecurity about the West Berliners. This was demonstrated by a live-for-the-moment, unrestrained way of life for its residents. The western part of the city was vibrant making a visit to the east acutely paradoxical. On the day of the East Berlin visit I remember wearing a badge on my right lapel with the word ‘Nosferatcher’ and a cartoon of Margret Thatcher as Nosferatu on it. As I went through Checkpoint Charlie one of the guards said “What is this?!”. A joke, I said. The guard looked at me with an expression of, “We don’t make jokes in East Germany!” A friend on Facebook, who lived in the East around that time, confirmed that, “We went in the cellar to laugh. Very stern upbringing”. I was allowed to keep the badge though. One of the places we visited was the Berlin TV Tower, constructed between 1965 and 1969, still prominent in the Berlin skyline today. On approaching the entrance to the tower an old man reprimanded us for walking over a patch of mud that presumably had once been covered with grass. We had to use the stairs to climb to the visitor-viewing platform, over 200 metres above the ground. It was a very grey, wet and misty day with poor visibility but I managed to take one photograph, the first one of the two. I returned to Berlin in 2008, whilst doing my Masters in Digital Media, to attend the Transmediale festival at the Haus der Kulturen der Welt (House of the World’s Cultures). I retraced my steps, much easier now the wall was down. Again I visited the TV Tower close to Alexanderplatz, this time using a lift to the viewing platform. It was here that I shot the second photograph from the tower. Alexanderplatz was now an energetic conurbation favoured by bohemian types, now reunified and regenerated. 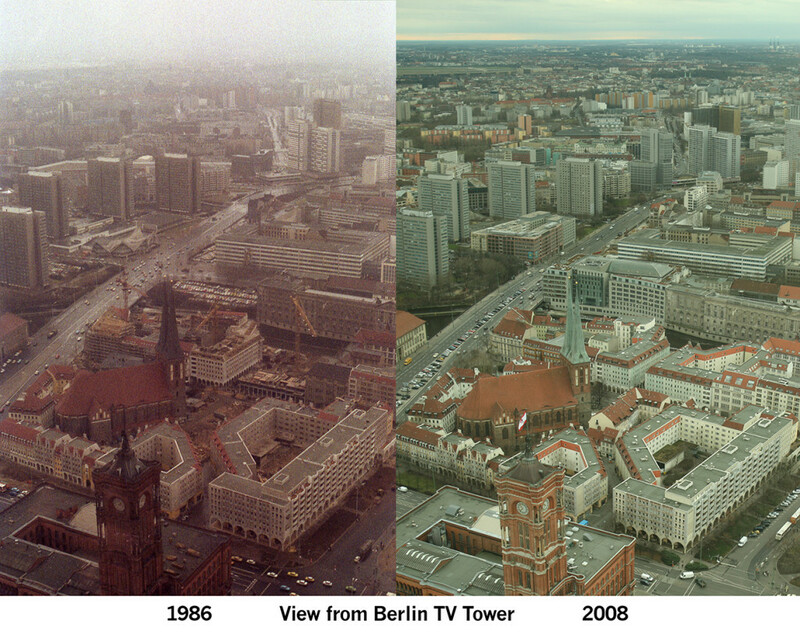 Here are the two photos placed together, taken from same viewpoint, from the TV Tower in 1986 and 2008. The pictures show a view southwest from the Tower over the Rotes Rathaus (Red City Hall) and Nikolaikirche (St. Nicholas’ Church). There are noticeable changes to some of the spaces and buildings but much of the layout of the city view is the same. 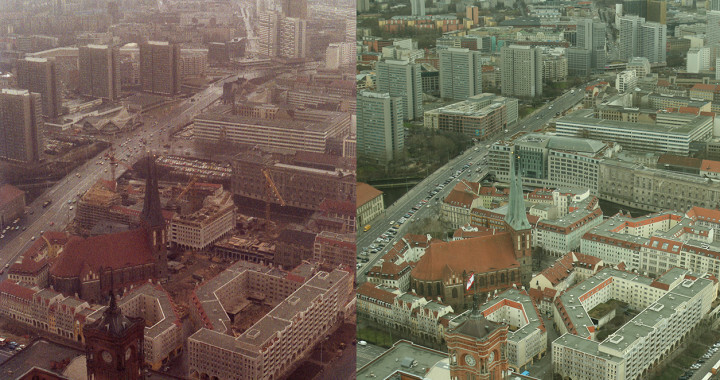 The image quality of the 1986 photograph, on the left, has been formed by a combination of ‘grainy’ film stock, digitalisation and it being a particularly grim, misty day in East Berlin. Both photographs were taken using SLR cameras the 1986 on a Canon A1 (film) and the 2008 photo taken on a Canon EOS 400d (digital). I tweeted the image and got ‘likes’ from Deutschland 83’s production company, Walter Presents, Executive Producer, Jörg Winger and Writer & Creator Anna Winger. Due to the restrictions placed on parts of Berlin by the Wall, many places in 1986 were inaccessible. 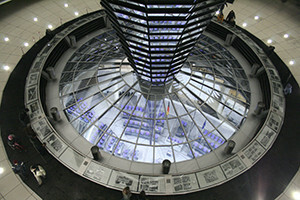 In 2008 I was able to visit the refurbished Reichstag, which in 1986 had been closed to the public due to its part destruction and proximity to the wall. In 1999 British architect Norman Foster created a dome in the centre of the building to symbolically highlight the sovereign status of the citizen over their elected politicians, who serve them in the chamber below. The Brandenburg Gate was unreachable in 1986 too, being in the no-man’s-land border between east and west. Now restored and accessible, I walked through the area where the wall used to be, the setting for news reports and pictures of the wall being torn down by citizens in 1989. Given the GDR’s vast historical surveillance programme by the Stasi of East German citizens and the previous totalitarian control exerted by the Nazis, it is little wonder that the German people take their privacy very seriously. In 2008 Germany introduced a Right to Online Privacy, which prevented government surveillance of personal computers. It is, therefore, unsurprising that Germany is now considered one of the safest places in the world to circumvent online surveillance and a haven for people pursued by the security services. The two photographs, taken 22 years apart, represent two acutely different periods in Berlin’s recent history, one of authoritarianism and one of liberty. Revisiting the cold war era through dramas such as Deutschland 83 and Bridge of Spies helps remind us that freedom and privacy are fragile states no-one should take for granted. Posted in Digital Media, History, Photography and tagged Alexanderplatz, Berlin, Berlin Wall, Bridge of Spies, Checkpoint Charlie, Deutschland 83, East Germany, German Democratic Republic, TV Tower, West Berlin.